Our Outpatient Rehab Program is led by experienced, pediatric-trained specialists. Clinicians at Children's develop unique treatment plans for patients from birth to age 21. Outpatient rehab services are available at several neighborhood locations throughout metro Atlanta. We offer comprehensive outpatient rehab treatment through a variety of specialized programs and therapies. Although the ear is a small part of the body, it can have a big impact on a child’s life. When a child has hearing difficulties, it can affect the development of his communication, academic and social skills. Children’s pediatric audiologists (hearing specialists) specialize in identifying hearing loss and designing a rehabilitation plan. Our audiologists work with pediatric-trained otolaryngology (ear, nose and throat, or ENT) surgeons to provide comprehensive care. We use current hearing technology and communication training to help children develop listening and language skills. Our professionals use a variety of methods to find the source of a hearing problem and determine treatment. We routinely assess patients scheduled for speech-language evaluations to determine if hearing may be an underlying factor in a child’s speech and language difficulties. We also address problems related to recognizing and interpreting sounds. A child with auditory processing disorder has difficulty with how the brain processes, or hears, auditory information. This type of disorder may cause difficulties with listening, understanding speech and following directions. It’s not a result of permanent hearing loss, attention difficulties or a developmental disorder. Children must be at least 7 years old for an auditory processing evaluation. In addition, pediatric audiologists provide vestibular rehabilitation services, including comprehensive evaluation and treatment, to identify and relieve symptoms of ear-related balance problems. We offer our audiology services at all Children’s outpatient neighborhood locations except Sandy Plains. Call 404-785-7174 for more information or to make an appointment. Our pediatric-trained physical therapists are leaders in treating children. We work with patients and their families to set individualized goals for physical therapy. Pediatric occupational therapy teaches patients to reach independence through self-care activities important to daily living. Our pediatric occupational therapists use age-appropriate methods to maximize a patient’s potential through positive, team-oriented treatments. This helps children, adolescents and young adults at home, school and play and in the community. Identifying and treating speech, language and voice problems as early as possible helps children meet their full potential. Pediatric speech-language pathologists at Children’s help correct those problems with the expertise, diagnostic tools and treatment methods that help children develop strong speech and language skills. The multispecialty team at our Assistive Technology Center offers broad-based expertise and state-of-the-art technologies to meet the special rehabilitative needs of our patients. 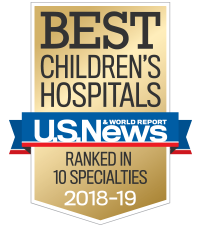 Children’s has had more than 88,000 patient visits to our outpatient rehab facilities every year for the past five years for a wide array of conditions. Our high patient volumes mean our rehab team is more experienced and better equipped to meet the needs of growing and developing patients. We offer our outpatient rehab services at nine neighborhood locations, which gives our patients the care they need, where they need it. Our staff—including audiologists, physical and occupational therapists, speech-language pathologists, and other professionals—helps patients regain and improve their independence. We involve each patient’s family in therapy so rehab can continue at home, allowing patients to relearn skills and recover more quickly. Therapists from our different locations share progress and information to be sure the best possible care is given to all patients. All Outpatient Rehabilitation locations are departments of Children's at Scottish Rite hospital.